Frankie Lombardi is a drummer, vocalist, songwriter, guitarist currently performing in the Sarasota area as an acoustic solo artist as well as in duos and bands. 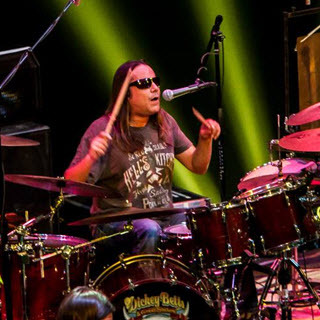 Frankie Lombardi has been a drummer/vocalist for Dickey Betts & Great Southern since 2000. Industry veteran Frankie Lombardi has been playing drums for over 25 years. After studying at the drummer’s collective in NYC, Frankie moved to Boston to attend the Berklee School of Music. While in Bean-town, Frankie joined Boston rock band Sunshine Jive. Frankie then left for California to play with guitarist Blues Saraceno and opening for Steve Smith’s Vital Information. He was soon back in Boston to record Sunshine Jive’s debut release entitled Sunshine Jive at Michael Bolton’s Passion Studios in Westport, CT. The record was released in Japan and 14 countries in Europe by MTM music (a German company). Frankie moved home to NYC to play with Furious Styles, described as a ‘Tower of Power without horns.’ During this time, Frankie finished recording his first solo release entitled Shank Songs. Frankie Lombardi also serves as a staff music writer (programmer) for Soundtrack Recording Studio’s N.Y.C./Boston, and has played drums and percussion on numerous recording sessions including Fayva, Home Depot, AT&T, WWF, Sylvania, Casual Male, Baybank, Tupperware, SNET, Volkswagon, WCW, Norelco, etc. In addition to his work as a studio musician/band member, Frankie is also a member of the New York City Players. He traveled to Paris to perform in a Richard Maxwell production called “Cave Man”. You can also hear Frankie on Richard Maxwell’s debut CD entitled Showtunes.